I think anything with the word “night” in its name benefits from a bit of mystery by association. As if Yellow-crowned Night Herons needed the help. With gorgeous plumage and reliably picturesque harbor backdrops, these birds are a favorite of NYC Auduban/New York Water Taxi tours and individual birders. Fellow LIC Community Boathouse volunteer Ted Gruber snapped this shot in Steinway Creek, where it was perched atop a collapsed dock. A solitary Black-crowned Night Heron was nearby as well. I’ve found the black-crowned variety to be more common, but having both in view was ample reward for our early start and two crossings through whirl-pool filled Hell Gate. Okay, so I admit I love going through Hell Gate at peak current. 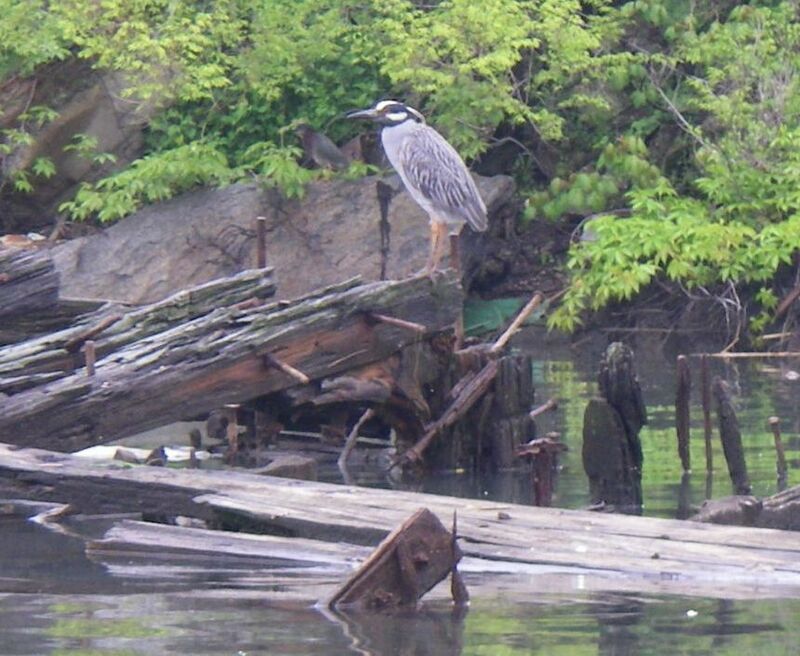 Yellow-crowned Night Herons have been spotted at City Island, but I would imagine that Staten Island and its nearby islands in the Arthur Kill would also provide good habitat. Any other recent sightings? We didn’t get to see this bird lunge at a crustacean, insect, mollusk, amphibian, or fish. The action happens in darkness for this species. Instead it (the sexes look alike) simply held its place in a stately fashion. The species is threatened in our area, but ironically it’s also more widely dispersed than before; when the Bermuda Night Heron went extinct, environmental authorities there imported this North American species and plugged it into the vacant ecological niche. Yellow-crowned night herons lay their eggs in overhangs, whether a living bush or a jutting piling or beam. We didn’t see if this one had a blue-green clutch of eggs because getting that close would disturb it. The geese and mallards along the East River shores and on North Brother and South Brother islands had full nests, so perhaps there’s a decent chance that New York City has an upcoming generation of Yellow-crowned Night Herons warming in Steinway Creek? I’ll write a more complete report on the Steinway Creek at a later date. Due to an imminent property sale, the city and state should aid Astorians in seizing a rare chance to ecologically restore the petroleum-despoiled, sewage-filled waterway and its surprisingly verdant southwest bank. Toss in a kayak launch, and you’ll have a constituency to keep it green, blue, and clean for neighborhood youth…human and heron.